Following a hugely successful Day of Action in Milnrow on Wednesday, the Rochdale Safer Communities Partnership will be addressing issues, clamping down on crime and interacting with residents in Spotland and Falinge on Friday 11 and Saturday 12 April. Police Communtity Safety Officers provide a Safe-Plating service to local residents. Police Community Support Officers meet local residents in Milnrow Memorial Park. 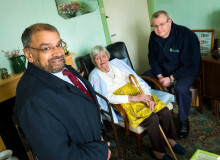 Cllr Sultan Ali, Cabinet Member for Strengthening Communities, and a local Fire Safety Officer meet with an elderly resident in Milnrow.